Nicotine is an addictive drug. According to the American Heart Association, nicotine provokes changes in the brain that makes you want it more and more. Exposure to nicotine also provokes some unwanted health consequences such as increased blood pressure and increased heart rate. A study performed by the Centers for Disease Control and Prevention revealed that some foods that we consume on a regular basis contain nicotine. The food that is richest in nicotine concentration is eggplant. 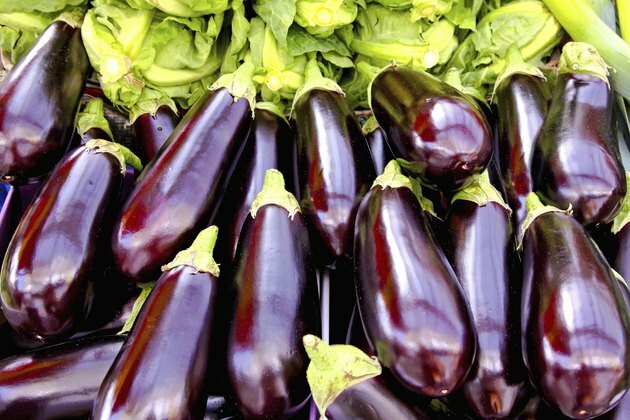 Eggplant contains a nicotine concentration of 100 ng/g. This vegetable is also a very good dietary source of fiber, vitamin B1, vitamin B6 and potassium. According to "The Encyclopedia of Healing Foods" by Michael T. Murray, the health benefits of eggplant consumption are directly linked to the presence of a strong antioxidant called nasunin. Nasunin protects the body against free radical damage, helps rid the body of excess iron and helps lower cholesterol levels. Green tomatoes also contain dietary nicotine. The nicotine content of green tomatoes is 42.8 ng/g. According to the United States Department of Agriculture, green tomatoes are also a good dietary source of potassium, phosphorus, vitamin C, folate and calcium. Cauliflower is another food source of nicotine. The nicotine concentration contained in cauliflower is 16.8 ng/g. According to MyHealthyFoods.com, cauliflower is also an excellent dietary source of vitamin K, vitamin C, folate and fiber. Regular consumption of cauliflower will promote some health benefits such as protection against some forms of cancer, detoxification in the body and protection against rheumatoid arthritis. Another food that could expose you to nicotine is potatoes. Potatoes contain a nicotine concentration of 7.1 ng/g. According to Ayushveda.com, potatoes are also a very good dietary source of vitamin B6, vitamin A and potassium. The combination of these nutrients make the consumption of baked or boiled potatoes effective prevention against cardiovascular disease. According to the website, people who consume baked or boiled potatoes have a lower risk of heart attack and frequently have lower blood pressure than people who do not consume potatoes.